Not everyone is a graphic designer – and not every job requires hiring one. Sometimes, in-house is the best, or your only, option. But what if you aren’t as confident in your own design skills? 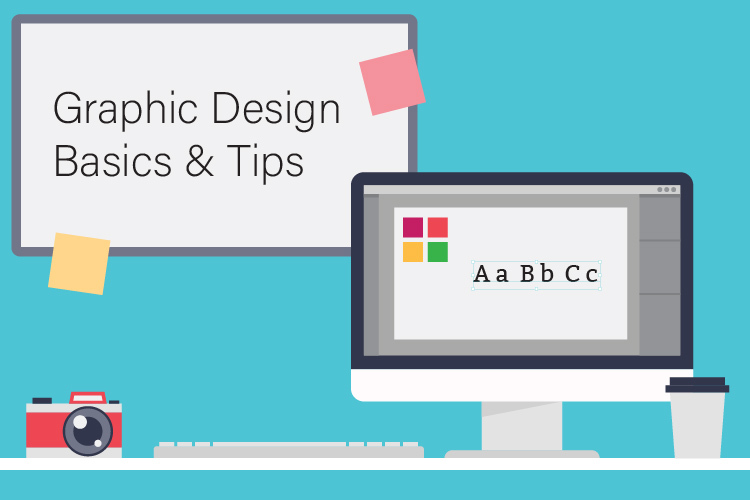 Just like everything else, graphic design has a set of foundational rules that can really improve the outcome of your work. What should I expect from this podcast? We are not going to discuss how to create the new award-winning piece of print collateral resulting in you becoming the darling of the office and the envy of all of your designer friends. Our goal is to create something that doesn’t look like it was done in-house. We want the job to be professional looking, but not take forever to create. Staring at a blank page can be daunting. But you have to start somewhere. Here’s a nice recipe to get things rolling. Gather all the available content – text, logos, photos. Is there anything missing? What else is needed? Make sure you’re clear on the purpose of the piece. What, ideally, do you want the person viewing it to do? Is it grammatically sound? Check word usage as well as grammar. Is it tailored to the audience you’re trying to reach? Is the copy too technical for your audience? Avoid jargon and industry buzzwords if they’re not meaningful to your audience. Does it tell them all of the important facts (what, where, when)? Sometimes it helps to have someone who doesn’t know the information inside and out review the piece – it’s not always easy for you to see what’s missing. Is it easy to scan? That is, can a reader look at it quickly and come away with the gist of what you’re trying to get across? Sometimes bullet points (like this section of the article) are the best way to convey information quickly, and help you keep things brief. Does it tell them what you want them to do (buy, call, visit)? This is your call to action and is the most important part of the whole thing. If your audience doesn’t know what you want them to do, you really need to revisit your copy. Review the imagery. Are the image files the right choice? If your images are bad, the best designer in the world won’t be able to put together a good piece. What if your images aren’t good enough? Well, maybe they just need a little love in the form of editing — free image editing software is available online — or maybe you just need new images altogether. (There’s an entire podcast available on photography here.) Here are some options. Are they the proper resolution and file type? Generally, you need 150-300 dpi for print, or 72 dpi for digital (such as email) — although bear in mind that if someone wants to print out something you email, you’ll be better off with 150 dpi. The formats .jpg, .png are best all-around, as they are easiest to manipulate in the widest variety of software packages. Logo sources. If you need a logo from, say, a sponsoring company or organization and do not have it, you can often download vector art from sites like Brands of the World. Stock photography an be a good option. It goes without saying that you cannot use images you find on the internet without permission. If you don’t have a good original image, you can purchase stock photos from a variety of sources — there are even royalty free stock image sources. This is invariably a better choice than a poorly-done cell phone photo. If available photography is terrible, consider graphics or staging a photo. Charts, graphs, or even a staged photo can save the day if available photography is lousy, and you can’t find something you like from a stock source. Crop carefully. Cropping your image can help the viewer focus on what you’d like them to see while removing parts of the image that aren’t relevant, or make the image fit into the available space (for example, a horizontal image into a vertical space). Be careful when you crop images of people – generally, you want to avoid cropping any image at a body joint (such as the knees), and leave enough head room. Images should have a hierarchy. Which is most important? It should be easily apparent. One large, and then a few smaller images is generally a recipe for harmony. Note that a collage or image montage almost always looks overly busy and amateurish, and should be avoided. Borders are a great idea. Placing a border around your photos will give you a nice, crisp edge. With all of the content collected, inspected and labeled in hierarchy, it’s time to start putting everything on the page. How should you start? Do a quick image search online of the type of piece you’re creating to see if there are general formats you find pleasing. We’re not suggesting you plagiarize, but looking critically at designs will help train your eye and give you ideas on how to start. Make a little sketch, using a pencil and paper, with boxes and lines that can serve as a rough guide. Literally draw a design to give yourself an idea of what you want your piece to look like — and then turn on the computer and recreate it. This is much easier than coming up with a design using a software application. Margins make all of the difference. White space is good – clutter is bad. Resist the impulse to fill all the white space with graphics and words. The cleaner your piece looks, the more appealing it becomes. Margins are especially important if you’re printing in-house, as your home or office printer will not create a “bleed,” where there is no margin (for example, when the photo or color box runs off the page). Give everything room to breathe. Leave room around logos and other graphic elements. If you find the copy is too long, cut it! Consider grid-based design. This grid should include a generous margin, and organized interior space — say, three or four columns. Then, you can one photo across all columns, a secondary photo across two columns, and so on. Content areas should be easily distinguished from each other. This helps readers absorb the information easily and quickly. Adding a colored box behind, say, the call to action is one way to help emphasize what’s most important. Is it easy to tell what you want the audience to do? If not, revisit your design and copy. Carefully choose your fonts. Generally speaking, you should go for two fonts, and you can use up to three different sizes. Do not make the mistake of putting everything in different fonts – this creates a cluttered, amateurish look – like one of those diner paper placemats covered with advertising. Pair type fonts carefully. Fonts should be visibly different. You don’t want stylized, fussy fonts – your overall goal is to be legible, so when in doubt go for simpler fonts. But don’t choose two that are overly similar — you should be able to tell at a glance that they are different. But fonts shouldn’t clash, either. One way to get a nice contrast in fonts is to choose a serif and a sans-serif font. Conventional wisdom is that serif fonts are easier to read in body copy, but sans-serif fonts are often favored for online use (such as the font you’re reading now.) When you pair fonts, compare what’s known as the x-height – that is, the height of lowercase letters. Fonts with drastically different x-heights at the same point size are more likely to clash than harmonize. When in doubt, Google “font pairings,” and you’ll get a long list of suggestions. Use bold and italic very sparingly. Italics, underlining, and bold should be used very sparingly, if at all. If everything is bold, nothing is. If you need to emphasize your call to action (or whatever), consider using a separate text block with a larger point size, or a different color. Don’t justify your text. This makes body copy hard to read, creating weird spacing that’s hard on the eye. Left justified text is always better. It’s always a good thing to get feedback from others. You might get the feedback, “the sponsorship information isn’t emphasized enough. Why not put that at the top instead?” Listen to their feedback about the problem (the sponsors), but trust yourself in coming up with the solution (how to emphasize them more effectively). Experiment, and trust yourself in the final design.